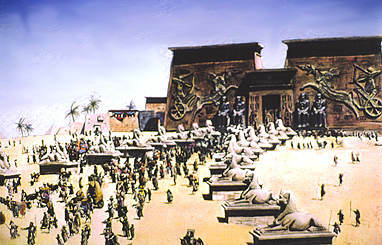 [Image: Cecil B. DeMille's not yet lost city – the set of The Ten Commandments, during filming]. "In 1923," we read, "pioneer filmmaker Cecil. 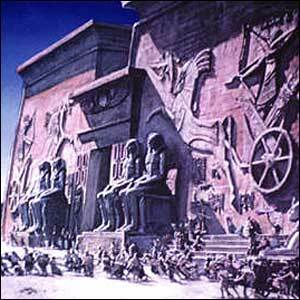 B. DeMille built the largest set in movie history for his silent (and early Technicolor) epic, The Ten Commandments. It was called 'The City of the Pharaoh.'" Constructing DeMille's instant city was no half-effort: "Sixteen hundred laborers built hieroglyph-covered walls 110 feet tall, flanked by four statues of Ramses II and 21 sphinxes, 5 tons each. DeMille populated his city with 2,500 actors and extras, housing them in tents on an adjacent dune." [Image: A scene from The Ten Commandments, via NPR]. Not one to leave his creation around for others to use in their own cinematic ways, "DeMille ordered that the entire edifice be dismantled... and secretly buried. 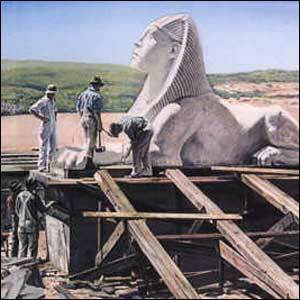 And there it lay, forgotten, for the next 60 years," eventually becoming known as the "lost city of Cecil B. DeMille." But then, in 1983, "a group of determined film buffs – inspired by a cryptic clue in DeMille's posthumously published Autobiography – located the remains of the set. (...) They brought in ground-penetrating radar to scan the sands, and hit pay dirt: the dune-entombed remains of DeMille's dream." [Image: The lost city, via NPR]. Peter Brosnan and John Parker – the "film buffs" mentioned above – arrived at the site to find themselves "in a field of plaster statuary... [T]here had been big storms, and more set was uncovered than had been seen in 30 years." They thus proceeded with the excavation... about which more can be read here. Meanwhile, something about this story reminds me (very vaguely) of Skara Brae, a 4000-year old Stone Age village uncovered not by archaeologists but by an especially violent seasonal storm on the far west coast of Scotland. "In the winter of 1850," Orkneyjar tells us, "a great storm battered Orkney. Nothing particularly unusual about that, but on this occasion, the combination of Orkney's notorious winds and extremely high tides stripped the grass from a large mound known as Skerrabra. The storm revealed the outline of a series of stone buildings that intrigued the local laird, William Watt of Skaill. So he embarked on an excavation of the site." [Image: Skara Brae, via Orkneyjar]. Orkneyjar goes on to explain that, "[b]ecause of the protection offered by the sand that covered the settlement for 4,000 years, the buildings and their contents are incredibly well-preserved. Not only are the walls of the structure still standing and alleyways roofed with their original stone slabs, but the interior fittings of each dwelling give an unparalleled glimpse of life as it was in Neolithic Orkney." In any case, combine Skara Brae and DeMille's lost city – then add a few ten thousand years – and you get future archaeologists uncovering, by accident, with the help and assistance of an unseasonal storm, the outlines of a buried city. Washington D.C., say, or perhaps Springdale, Utah. Thing is, these future archaeologists conclude that the city wasn't an actual dwelling place, not a real place to live – they discover far too many parking lots, for instance, and can't believe anyone would willingly live surrounded by those things – instead, they think, the city had been a monumental film set. Thus begins a whole new, Paul Austerian chapter of future archaeology – in which they hunt for the lost and secret films of a buried North America. Mention of Skara Brae also reminds me of Seahenge, a Bronze Age wooden circle which was revealed when the sands off the Norfolk coast shifted to reveal the 4000 year old stumps preserved in the mud. Controversy raged, and the Druids were up in arms, when English Heritage decided to literally 'up sticks' and move the monument further inland, which was documented on Channel 4's 'archaeology against the clock' programme Time Team - in a 2000 Christmas special, no less. wow, i never knew he'd buried that set. crazy. Skerrabra reminds me of the similar spectacular site "Jarlshof"
Erstaz, real, ... or Hollywood? Or, for that matter, much of California. Hollywood, and various parts of the state and nation, are about the conflation of fantasy with reality, and in places like Ramona, Bodie, Solvang, and now the Nipomo Dunes, the remnants of places made famous by fictional accounts, of movie sets, of archetypal 'wild west' towns, and of towns created as reflections of remembered motherlands dot both the physical and cultural landscapes. It will come as no surprise to future archaeologists that places built as fantasylands becomes real-life inhabited landscapes. The tricky part will be deciding whether the occupants believed themselves to be actors (a la Jamestown Virginia) or believed themselves and their setting to be something other than fantasy. In the latter case, one need only red some of William Cronon's stuff about the history of American landscape to see that fantasy had and has a prominent role in how Americans have understood themselves in relation to the continent. We might call this colonisation by theme park. If we then turn our attention to the business of naming subdivisions and streets, where every cul-de-sac is named Buena Vista or Royal Oak, where the iconography is always of a rural idyll, then we can see that the business of fantasy is still very much at work. So, for de Mille's Lost City, how long can it be before there are seaside strip-malls in the same style, a subculture of Pharoanic servants and elites, and a movie about life in a town built on fantasy? Fascinating. I was thinking, with the help of Lewis Mumford, just along the same lines the other day (i.e., future explorers uncovering the buried ruins of the 110 and 5 interchange). And the ersatz archaeologic digs of real civilizations (and the other way around) comment remineded me of one of my favorite books about just that: David Macaulay's Motel of the Mysteries. Makes you wonder how much we really have accurately deduced about all those dead civlizations. Not to deflate the heady speculatives riffs on the "lost movie set" theme, as I chime in late, but in case you're interested, Geoff: I have been to Skara Brae. It is a peak experience, for several reasons. The fact that it exists, first and foremost. "They" constantly talk about the fact that the British Isles, a relatively small space in the scheme of things, have been continuously inhabited for 6,000 years. And when you hear it repeated, as I did on a "Circumnavigation of the British Isles" (an insanely great expedition/idea, btw) it starts to sound like yammering. But when you are actually confronted with incontrovertible fact of a domestic interior from 6,000 years ago (give or take a few) (a seeing accompanied in your head by SFX and hyperspeed space-time collapse imagery) any notion that "the past is another country" is vaccuumed right out of your brain. The interiors you can see (specifically the one of the leader, whether he was a king, merely an elder or simply the rich guy, I can't tell you because by then I had ceased listening to any "audio" and was lost in retinal massage and fact-free free association) you look down into — through a glass roof structure. The excavations remain "bermed" probably to protect them from wind damage. You can only walk through a very limited area, which gives you a sense of scale (small people) and village organization. The preservation decisions have made for an "exhibition" experience of rare beauty and allows you to see the layout in a way that few other architectural sites do. Part god-like, part jewel thief. And that's what's so striking about the experience — the (breathless) realization that it is such a designed environment. Because the chief material was stone, it is decisively graphic ... in point of fact, it's primordial FL Wright. A couple of chuckleheads made Flintstone jokes, which on one level certainly apply, but the fact is, the home you can see into is simply beautiful. I stood there yearning to see what might have been on the mantel (yes, mantel) what objects, placed how, and with what attention to balance & composition, given the design of the rest ... 6000 years ago. I was going to make a comment, but now I'm thinking about how it might be to walk around in a 6,000 year old living room. Thanks, Christine. That's much better than what I originally had. Which was that the Mayans left behind their giant architecture and distinctly heirarchical society so that they could leave behind ruins to be discovered and conjectured over, and so that ultimately, Mel Gibson could make a movie about it. Only Mel was supposed to wait until 2012. The burried set is interesting but its designer, Paul Iribe was aslo one of the fathers of the art deco movement. Justin, what an elegiac posting ... I am sorry for the ruins & the inaction. Not for the plover tho. I grew up near a beach that was famously closed to 4-wheel drive vehicles for an entire season because a plover nested in the wheel ruts. Hello ... it's called a highway, and that plover should have been, in Darwinian terms, road kill. Anyway. Thank you so much for the info. I'd never heard of Iribe and am so glad I now have. Isn't this something George Clooney (given his brand positioning as "vintage Hollywood") could get with? Feel like giving him a try to lead a attention-shifting awareness/fund-raising campaign? Limos & klieg lights on the dunes? Benefit party for Darfur? Something like? ... I believe you would be most articulate and persuasive on the subject, and would kindle action.